Here are ten things I really love! It was actually a little hard to make this list; there are so many things in life that bring me joy. I kept adding things to my list, taking them off, re adding trying to discover my 'favorite' things in life. Finally I just changed the title from 'my favorite things' to 'things I love!'. That was much easier! Books - I love reading. When I was pregnant with my first (and actually had time!) I would go to a local bookstore curl up and read for hours or, if time was more limited, I would just walk along, scanning book titles, reading paragraphs here and there, and always always sticking my nose in and enjoying the new book smell. Conservation Areas - I am so thankful to live in Ontario and be surrounded by such natural beauty. I love our conservation areas (we have so many near where I live) and each one has something unique to offer. We have had so many adventures exploring, sneaking peeks of wildlife, splashing in creeks, and coming out covered in dirt with gleeful smiles on everyone’s faces. My Rocking Chairs - I found this pair on the side of the road with a free sign attached - score for me! They are actually super comfy and I have enjoyed many afternoons curled up watching the rain, watching the boys play, and reading some of my favorite authors. Mounted Prints - I adore printing my work. Seeing what I have been able to capture printed and in my hands - a tangible memory - is such an incredible experience; so meaningful compared to just seeing it on a digital device. I love printing my work on styrene - it makes a thick print, extremely durable, and doesn’t need a frame! I have picture shelves that I love and have my images sitting on those, and I can swap them out without any hassle. The Sound of the Dishwasher - this might be a little weird but I always look forward to turning on the dishwasher in the evening and listening to the swish swash as I work. Maybe because it signifies a (finally) quiet, clean house and a chance for some me time before bed. Or maybe it’s just because I know something is working hard and doing a job for me! Rain - I have my Dad to thank for my love of rain. Whenever the clouds would open and rain would drench the earth he would gather us together on the porch to watch the rain come pounding down, breathe in the freshness of a newly watered world, and just sit, all cozy together. I carry that tradition on with my boys - though it usually involves them with buckets to hold over the edge of the porch and then dumping them over top of each other’s heads. My 135 mm Lens - I love this lens so much; it allows me to be a good distance from my subject but still capturing up close images. I have captured so many of my favorite images this way; just sitting waiting for magic to happen, out of their space, and capturing their little expressions without having to move! Babywearing - We wouldn’t be able to go on half the adventures we do if it wasn’t for my Ergo baby carrier. It makes life so much easier to just settle my 1.5 year old on my back and set off. He doesn’t get exhausted and my hands are free (this isn’t true - my older son just gives me rocks, sticks and dirt to haul instead). My Littles - these little people have captured my heart in a way I never thought possible. They keep me on my toes, always push me towards our next adventure, and bring out the kid in me. They have taught me so much about life and so much about myself. If you want to grow and stretch as a person - have kids! They have a knack for pushing you to your limits, filling you with crazy joy, and their little snuggles - I would hold on to those forever if I could. Cathy Marie Hake - My bookcase is crammed with books I have read several time - but there is a special shelf reserved for this author! I have read her books dozens of times (not exaggerating) and am nowhere near tiring of her works. She makes me laugh, cry, and her work is like a magnet - I just can’t get away. Writing this...I think I may just go read one of her novels again right now. I love to create. It’s something born in me; something I can’t escape. I love trying out new things, new textures, new ideas. If I couldn’t create a part of me would just shrivel up. I love creating with photography. There is just so much to it. Mastering photography (a dream of mine) is mastering light. I love playing with the light, seeing how it interacts with its environment; seeing how it reflects and bounces; seeing how different light can tell a story. You can do so much with light; you evoke emotion with light - bright and airy creates a feel of summer and laughter and joy; dark and moody can make for tender images, cozy stories. Little patches of light can highlight the pieces of the image that you want to draw the viewer's attention to, where you want them to linger. My littles are growing so fast; I love that through photography I can capture the authentic stories of their childhood. I can create images to hang on our walls, albums they can flip through and remember - and when they are too little to remember, I can tell them the stories that go with the images. 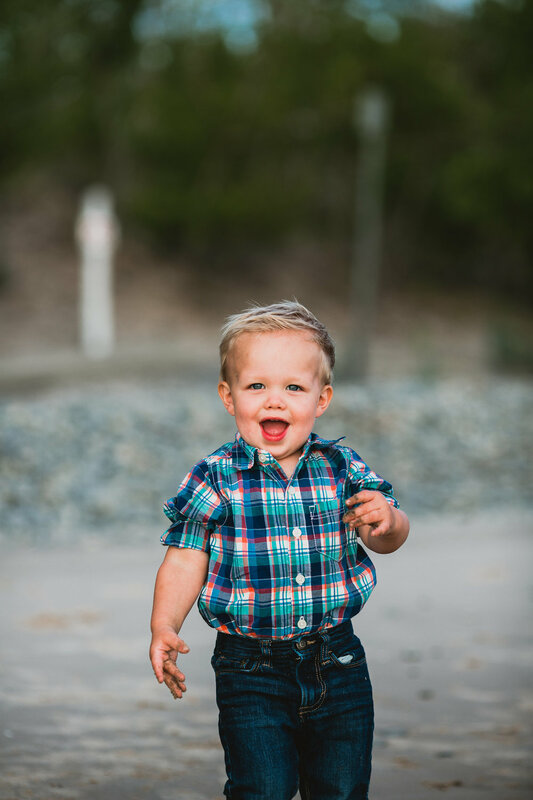 Already, with my eldest being two we cuddle on the couch and look through images and talk about four-wheeler rides, swimming in the pond, and kicking a soccer ball (rather haphazardly) around with daddy. I can’t wait to share even more of the adventure with them; capturing it through the play of light, allowing my creativity to be a part of their story. It's summer! and I don't know about you but I have one thing on my mind - the beach! Sunshine, sand, and waves. That'd make me a happy girl - and an even happier photographer! Add to the mix a crazy beautiful family with just about the cutest toddler. Okay, did you see his perfect little hair do? This family photography session doubled as a maternity session; pretty sure the new little one is going to enjoy being soaked in sunshine. Let me tell you a little secret - beaches are amazing (you already knew that!) but finding a location that has heart and meaning for you makes an incredible difference in your photography session. It is like sweet memories is incorporated into all your images. For this family it brought back memories of childhood adventures on the beach, seashell collections, and jumping waves; it also brought back memories of falling in love and dreaming of a family together. Alright, alright, I will stop talking about meaningful places for your photography session and let you enjoy this beautiful gallery!